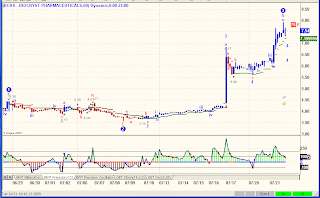 SRSR has fallen to about the price it was when I first mentioned the stock on July 1st. The catalyst for the recent volatility was the issuance of the National Instrument 43-101 Report calculating and analyzing certain company resources. I have read enough of the report to confirm the story, turning this pick into the proverbial "story stock." As such, I typically loosen my TA rules in deference to stellar risk:reward parameters. In summary, the next 5-7 years should see a maturation of resource development activities generating a significant appreciation of market capitalization. 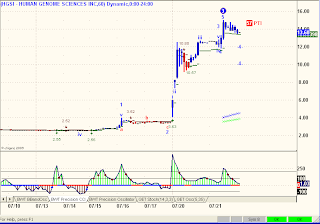 Estimates within this time period range from 50c to $2.00. Buying SRSR under 10c with a 50% stop provides a reasonable approach to realization significant gains, 5-10X returns over the short-term and significantly higher returns longer term. This kind of speculation is inherently full of risk and is not for everyone. My own basis in this stock is 2.8c so prices are a long, long way from my stop (which is now up at 5.6c for a little over a double if hit). In other words, don't base your analysis on what I do, unless your basis is close to mine. Several requests have been made for the SPX Weekly chart, which was a regular posting here until about a month ago. It's a simple story, but requires a little explanation. About 3 weeks ago a data glitch forced me to download new data for all of my charts from eSignal. Everything seemed to be fine, except when I brought up the SPX chart, the just triggered Sell Signal had been replaced by a continuation of the early March Buy Signal. 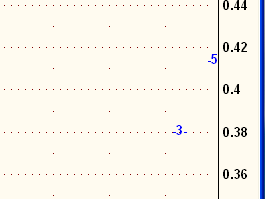 Despite many attempts to return to that original set-up and Sell Signal, my data just wouldn't allow it. Rather then confuse everyone with the new SPX chart, I simply switched to the SPY and DJIA charts, which never deviated from the initial triggers. 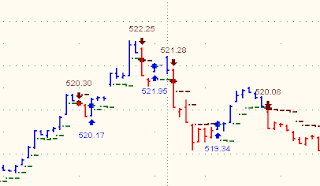 Noteworthy here is that the market has made a new Wave 4 high accompanied by a divergence in the False Bar Stochastic. My take away from all of this is that the worse of the bear market is still ahead, waiting only for what is a normal consolidation of the previous massive decline to run its course. “This gets back to just how smart a virus we’re dealing with. To boil it down to simplistic almost cartoonish terms, this thing has figured out how to survive the environmental conditions in which influenza viruses have never survived, namely heat and humidity. “It is contrary to all of influenza history to see a virus surviving the way this one is. It knows enough that vaccines- ever since we started creating vaccines- are produced in eggs and it’s genetic code knows enough not to allow a vaccine to be produced in eggs quickly. This is not by chance that we’ve got this problem. This all gets back to a virus that has been around for hundreds of years and through hundreds of years of experience has morphed itself into something that is wary of being trapped or deceived. 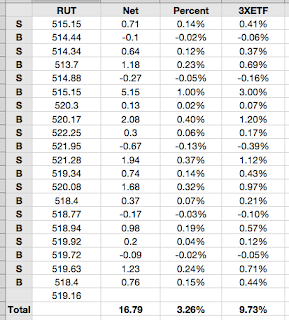 This morning I ran a Market Club scan of +100 rated stocks and found two stocks that are both China and Swine Flu plays. Let's add OPK and SVA to the Swine Flu Basket. I usually collect special requests and save them for days when I don't have anything else to write about, like today. I'm also answering one person in particular who is not and does not want to be an active trader, just wants to buy and hold stocks that are going up. Quaint concept. Nonetheless, as promised, two of your stocks are included below. 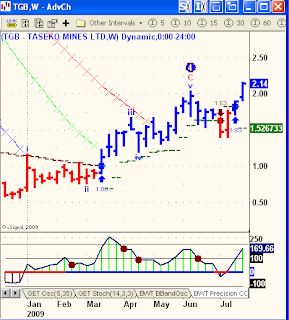 TGB was written-up back in January, just after it pierced through the $1.00 level. Other then some choppy action in June, it has been trending up the entire time. No reason to do anything here, it's going in the right direction without any help from my analysis. 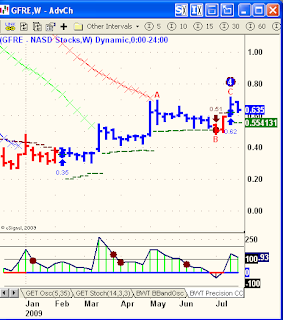 GFRE was highlighted back in December at $0.22 and has been a solid performer, quietly ringing up a 200% gain. If it breaks below $0.55, I will take some off the table, otherwise, just holding into the uptrend. 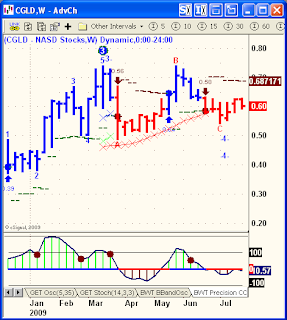 CGLD was part of a mid-January gold strategy. It's up about 30%, but it's chart is neutral at best, and a Blue Wave SELL at worse. The run has stalled, no way to make anything else out of it. 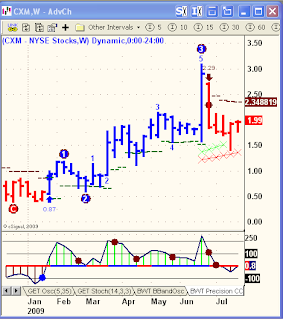 CXM was blogged in April when I wrote that if it broke through $1.87, it would target $3.50. Well it broke through $1.87 and ran all the way to $3.10 in June, for a quick 100%. I think it still goes to $3.50, but note that it did fall all the way back to around entry after the spike up in June. Pick 'em. I know there have been other stocks mentioned here in the past six months or so, some worked, some didn't, but these are the ones where updates have been requested. Of the stocks updated here, two stand out as Buys today. Knowing me, can you guess which two they are? I'll name them in a Comment soon after posting this blog. Last week I published an analysis of a few likely beneficiaries of Swine Flu publicity. Let's take a look at this idea, one week later. 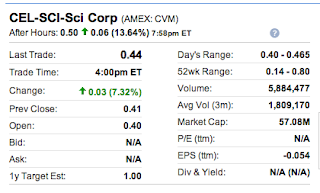 NNVC has risen from about 65c to 75c, a gain of about 15%. 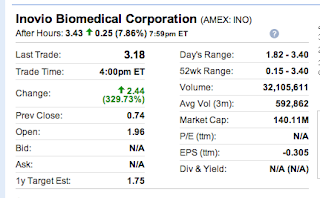 NVAX is up from about 3.00 to 4.23, a gain of about 40%. 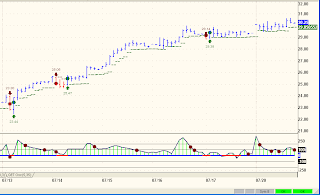 HEB spiked up but fell victim to some bad news and as a result, sits about right where it was last week, at about 2.45. I was stopped out last week on the bad news, a little bit lower then current prices. As a basket, the group is up about 30%. What now? Time to use your TA to protect profits, using a trailing stop, or a Daily Sell Triangle, or a Blue Wave Trend reversal. Except for NNVC, which is not to be sold under $100 a share. My first prediction was really an assessment, that a mega bear market had asserted itself and that premise would continue until, "proven otherwise." The issue today, just past the mid-point of the calendar year, is whether or not the action of the past three months has nullified the bear market premise? The above chart is the DJIA Weekly (line) chart going back to the beginning of the end of the bull market that ended two years ago, mid-2007. The chart indicates a five-wave advance from mid-2002 through mid-2007, taking 5 years to appreciate from about 7500 to just above 14,000 in October, 2007. That entire advance was erased at the March 2009 lows. 60 months of advance erased in 16 months of decline. The Weekly False Bar Stochastic has generated a non-confirmation as prices have made a new recovery high without the confirmation of the FBS making a similar new high. 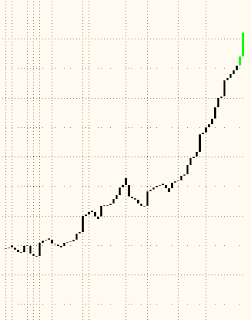 The Profit Taking Index ("PTI") is at 53 (lower right on chart). 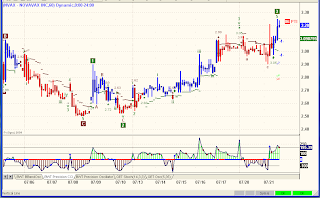 Any PTI above 35 is confirmation that a Wave 4 is in play and that Wave 5 will make new lows. Bolstering the implications of the above charts and indicators are the market views of Glenn Neely and Robert Prechter. On June 17, 2009 I posted a press release from Glenn Neely in which he forecast a 50% drop in the S&P 500 by year end. 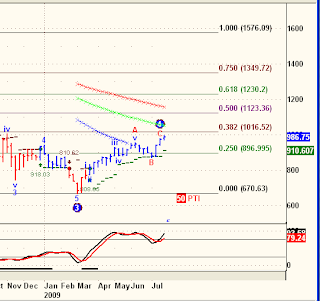 The market has rallied and is now at higher levels then at the time of his forecast. Neely has not waivered from his forecast and in fact is now suggesting that the persistence of this rally is likely to cause his forecast to be over optimistic and that the ensuing decline will be worse then he initially expected. We have now earned 800 [S&P] points worth of gains. This is surely the largest number of points that anyone has ever made, or will ever make, in the S&P futures in 19 months, and maybe ever. 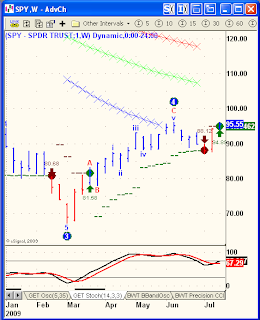 Prechter titled his latest [July 17, 2009] Elliott Wave Theorist, "THE BOUNCE IS AGING, BUT THE DEPRESSION IS YOUNG." In it he reiterated his big picture analysis and Wave count as a Primary Wave 2 Up afterwhich a Primary Wave 3 Down will decimate global markets. Thus, Neely and Precther are both suggesting the worst part of the bear market still lies ahead. My operative wave count remains a Wave 4 up that is still not yet done, to be followed by another leg down to new lows, below 6600 on the DJIA. These all represent forecasts, big picture views that are used more for perspective then trading. In summary, my analysis from January 1 remains unchanged, that we are in a mega bear market that has not yet been nullified and in fact, is approaching it's next leg down. 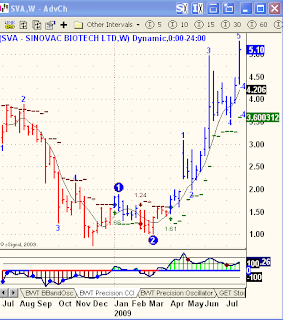 In my January 1 blog I also named NNVC as my "Number One Pick for 2009." The stock closed out 2008 at $0.81 and sits at $0.69 today, about 15% lower for the year. Has anything changed? Yes. I've chronicled the laboratory progress of the company in numerous posts over the past 6 1/2 months. In addition to what has already been posted on this blog, here are some snippets from, "DrFeelgood," a pseudonym for an NNVC shareholder who posts on iHub's NNVC board and who seems to know more about the company and its prospects then anyone I have encountered outside of management itself. AdenoViriCide will be approved for use against all Herpes and other indications will be expanding. Market potential will be more than $10 billion. Upper-middle opportunity should be in the $4 billion range. HIV-Cide will be approved and more than a year into use as HIV antiviral to reduce viremia to functionally zero. HIV-Cide will also be tested for use against other indications caused by other Retroviruses. NNVC will capture at least $5 billion of that market. BioShield will be feeding $500 million a year into NNVC to maintain a supply of strategic antivirals. FluCide will be emerging from Phase-3 trials for commercial use against seasonal variations, while it will be added to emergency stockpiles for use against High Pathogenic Influenzas all yielding around $1 billion a year with another $5 billion in potential market saturation after approval. RabiCide will be in use worldwide for another cool $300 million. Yes, market share could easily approach 75% which would dwarf these numbers. If NNVC licenses all the above, royalties would be based on 14.8 billion in sales yielding almost $3 billion a year in payments not including benchmarks for expanding market and indications. Market cap would easily surpass $100 billion or $800 a share and rising. Like I said $100 a share in 5 years might be a tad pessimistic. At the peril of posting something that might be read after a PR in the morning, if there's a PR, I post an updated version of "For What We Await." 1) Generally, from a global perspective, we await FDA approval of a paradigm changing technology applied to antiviral therapy. No matter which of the first indications to emerge from clinical studies and into the market, what will find approval will be an antiviral that is, first, non-toxic to the host system at therapeutic levels while at the same time being more potent as an antiviral than any other in the history of antivirals. It will, second, target and destroy virus particles by exploiting the very properties that allow viruses to exploit host cell properties. Third, it will accomplish the above by mimicking the properties of host cells; that is, viruses will "think" the nanoviricide is a comfy little cell to call home while it spins off duplicates from safely within. But, this won't be what it "thinks," for it will, fourth, attach to the surface of viruses like eggs thrown by teenagers at slowly passing cars attaching to the surface paint. Unlike cars and eggs, the virus' outer shell will be torn to fragments spilling the capsid interior and exposing the soft insides to the ravages of the immune and metabolic processes. Nothing else yet works like a nanoviricide. 2) There are more than a dozen indications in development by NNVC. However, the main focus now seems to be five virus types: Orthomyxoviridae or more specifically Influenzas, Adenoviridae or more specifically eye herpes and EKC, Rhabdoviridae or specifically Rabies, Retroviridae or specifically HIV, and Flaviviridae or specifically Dengue. If we examine these 4 foci more closely we get a few insights into some apparent executive strategy. Rabies testing is probably the least interesting of the five, yet it too is exciting. There are more than 50K deaths each year from Rabies. Rabies is 100% fatal after the onset of symptoms. Om testing, following infection and the onset of symptoms, 30% of the mice in two RabiCide studies survived. Wow. Historic. Recent HIV testing indicates that nanoviricide is a functional cure for the disease using HIV-Cide alone. However, what many may not be aware is the various members of the genus Retrovirus are associated with cancer and tumor growth and can trigger those conditions. Moreover, HTLV-1 Retrovirus causes T-cell leukemia and T-cell lymphoma in Humans. Thus success with HIV could also be the pathway to a nontoxic treatment for some types of tumors and cancers as well as T-cell leukemia and T-cell lymphoma. Finally, there is Dengue. Dengue is the gateway to BioDefense. Success with Dengue leads to other stockpile antivirals such as Ebola, Marburg, Lassa fever, Hantavirus, Crimean Congo hemorrhagic fever, Rift Valley fever, Yellow fever, West Nile, and Western equine encephalitis among others. Oh, wait, Ebola is also currently on the plate with Dengue. In the immediate future we are looking for news regarding HIV-Cide testing, funding for Dengue testing, progress on the progress for the Eye Herpes tests at Feinstein Institute, LSU and of course the MTA pharma. We also await the RabiCide update from the CDC and FluCide news from LSU. >>"What excites you the most over the next 6 to 18 months?" 1) The promise of veterinary use against eye herpes. This is a much bigger market than many realize. 2) Taking EKC into clinical studies. There are parallel studies in the works for EKC/eye Herpes. Once these pre-clinical studies are complete there should be an IND filing with or without the current MTA big pharma on board. Once the tox package is complete, there will be more pharmas interested in licensing. 3) HIV may be history. Sure there will be other therapies developed to replace the current stable of drugs used for HIV maintenance programs, but none of them are functional cures since eventually all lose their efficacy. First, HIV can't shift or mutate away from HIV-Cide. Second, from all I've read up to thise point and the more I read the more I think HIV-Cide may actually cure the disease. If HIV-Cide actually does cause infected T-Cells to form a viral synapse and bud its load of HIV particles, then over time HIV would be eradicated from the entire host system. There is nothing else out there even close to the same prospect. Vaccine for HIV within 5 years? Well, maybe, but doubtful. Even so, what about all the millions of people infected for whom a vaccine is totally worthless? 4) DengueCide should be eligable for orphan drug status. Sure there are millions of cases every year around the world, but there are only a few cases within the US, and those cases are becoming more numerous with every year as Dengue territory migrates north from the tropics. There are far less than 200K cases of Dengue in the US each year, so for the US it is an orpan drug. Puerto Rico, Guam, U.S. Virgin Islands, American Samoa, Northern Mariana Islands, as well as the southern most states and Hawaii all are in need of Dengue antivirals and that need grows each year. Moreover, Dengue antiviral will be the gateway to Marlburg, Hanta, Rift Valley, Chikungunya and a host of other vector born viruses. 5) A licensing agreement for the completion of development of any of the drugs listed above plus FluCide, which I haven't mentioned until now. FluCide should be the largest market of the lot. Since the influenza market potential is the largest of the lot, a license to complete the development of FluCide should fetch enough in upfront, annual, and benchmark payments to cause earnings to exceed 25 cents a share all by its lonesome. Now, add 2 or 3 agreements and then think about it. Pretty exciting, yes? I reiterate my forecast that every 10,000 shares of NNVC at today's prices [$0.69] will be worth at least $1,000,000 within 5 years. 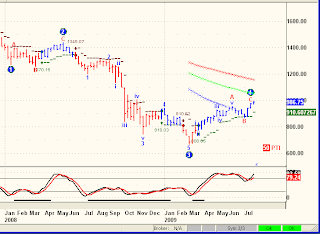 The third subject of my January 1 post was the outlook for Gold. I've expanded that subject a little today, to include in addition to Gold, Silver and other Precious Metals. The XAU was at 122 on January 1st and closed at 149.50 this past Friday. That's a gain of about 22.5% for 6 1/2 months. 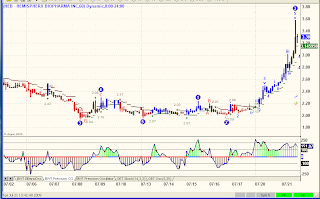 AUY went from 7.67 to 9.45, for a gain of 23% and NG went from 1.56 to 4.18, for a gain of about 170%. 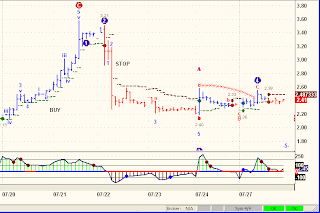 SRSR which I highlighted on July 1 at 8 cents, is at 17 cents, for gain of about 112%. The moral of this story? A basket of select mining shares offers way more price appreciation potential then a Gold index or Gold ETF. The Weekly XAU chart above suggests further upside for now. Prechter is forecasting lower Gold prices before a tradable bottom while Neely is suggesting the opposite, higher prices and then a tradable decline. My summary for this sector is to keep seeking out technically attractive mining stocks that offer above average and occasionally stellar returns. The market is going to be volatile no matter what direction it goes, but a major bear market has asserted itself and until proven otherwise, that's the course of future prices. My best pick for appreciation this year is once again NNVC and it is not too late to buy this stock based on where I am suggesting it can go in the years ahead. Finally, Gold and Gold Stocks may be my next best idea if the rally from the late October lows extends on the heels of geopolitical and domestic economic cycles that are running the scary side of miserable in the current global environment. Hundreds of thousands of Americans could die of the swine flu over the next two years if the vaccine and other control measures for the new H1N1 influenza are not effective. And, at the pandemic's peak, as much as 40 percent of the workforce could be affected, according to new estimates from the Centers for Disease Control and Prevention. This may present an excellent trading environment for drug makers' stocks and I have gotten the ball rolling with my July 21 Mini-Flu Basket of vaccine-related stocks. But let's not forget that during the Bird Flu scare of 2006, NNVC ran from 10c to $3.75. Since that run, NNVC has successfully tested its anti-virals and has gotten the attention of the CDC, NIH, LSU, and major pharma. Among the targets for NNVC's anti-virals are Swine Flu, Bird Flu, General Flu, Herpes, HIV and Rabies. 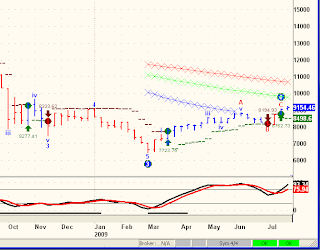 Whatever the markets do in the second half of 2009, NNVC will be in it's own world of investor discovery. It remains my top pick for the year. 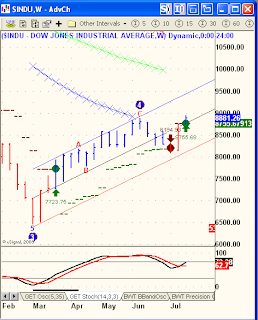 According to these Weekly charts, the next two days are critical for the Intermediate trend of the market. The chart above is a Weekly DJIA chart, showing a Sell signal two weeks ago, reversed to an interim Buy signal this week, confirmed only if the DJIA closes the week above 8755.68. The chart above is a Weekly Russell 2000 chart, showing a Sell signal two weeks ago, reversed to an interim Buy signal this week, confirmed only if the Russell 2000 closes the week above 528.50. The chart above is a Weekly SPY chart, showing a Sell signal two weeks ago, reversed to an interim Buy signal this week, confirmed only if the SPY closes the week above 94.89. 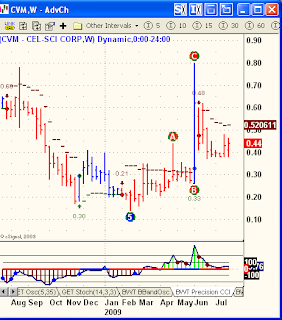 At the top of my list of Flu stocks is NNVC, a topic already well covered in prior blogs. We like NNVC for a host of reasons, Avian, Swine and other forms of Flu among them. 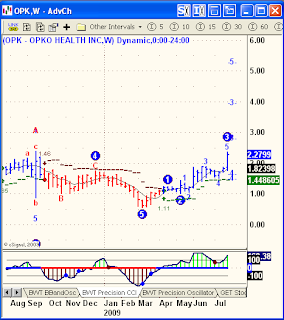 For today's blog, I want to focus on three low priced stocks that are running in the atmosphere of a global flu pandemic, BCRX, HEB and NVAX. 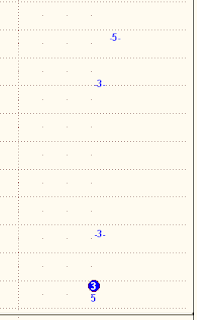 The only feature I considered today before buying these three stocks is that they were all in Wave 3 advances based on their hourly price charts. Although it is possible that I bought them all at their Wave 3 peaks, that is unlikely, especially since all are nicely up from my purchase prices early in today's session. The North American Monsoon (NAM) occurs from late June or early July into September, originating over Mexico and spreading into the southwest United States by mid-July. It affects Mexico along the Sierra Madre Occidental as well as Arizona, New Mexico, Nevada, Utah, Colorado, West Texas, and California. 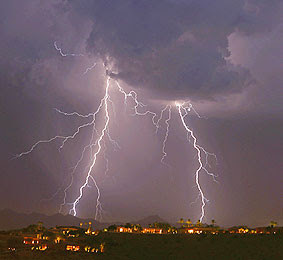 It is also sometimes called the Desert Monsoon as a large part of the affected area are the Mojave and Sonoran Deserts. 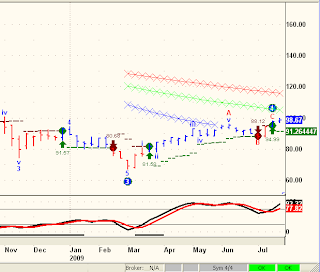 Above is the chart of the RUT index, an almost perfect week long Buy Signal. 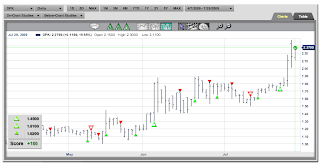 Almost, because there are five bars on the chart that turned red, indicating a brief Short. 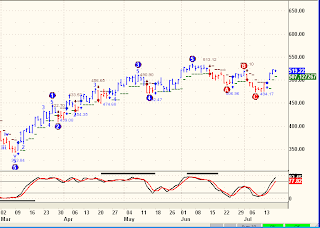 But looking carefully at the bottom CCI indicator, there never was a confirmation of the Sell Signal. In other words, the CCI never broke below it's zero line. That's up to the trader. Enough of these non-conformations and yes, it should be a rule. But even if one flipped Short for five bars, not much harm was done. 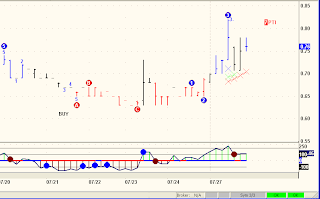 Bringing up the above chart of TNA there is again, an almost perfect week long Buy Signal, interrupted only twice by brief Sell Signals, again unconfirmed by the CCI indicator. 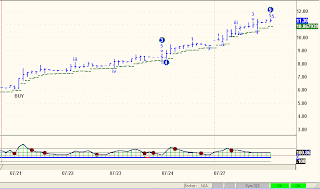 The gain on this chart is almost 7 points, or about 30% for the past week. 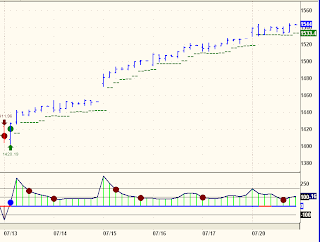 From it's Buy Signal one week ago, a flawless uptrend. But also note how close the reversal stop is for a new Sell Signal. Wednesday is the date of the super moon. With hourly reversals so close and the unknown effects of the super moon almost upon us, this has the making of great trade set-up. As always, we trade the trend, not the forecast. I keep a notebook (actually several) of all of my trading ideas including results from back testing from all of the various stocks, indexes, etf's, futures, market statistics and yes, even planetary alignments, tides and lunar cycles. While reviewing all of my Blue Wave test results today, I stumbled upon a consistency heretofore completely unnoticed yet intriguing in it's premise and applicability to trading, especially trend trading. It appears from my testing that one particular trading vehicle consistently generated better results, sometimes much better results, then any other. What I found was that the Russell 2000 index (RUT) did better in my myriad of testing then any other index, including SPX, OEX, QQQQ, SPY and DIA. The Russell 2000, while not as popular as the S&P 500 or the Nasdaq, is actually much easier to trade. The broadness of the Russell's index causes it to trend better than the Nasdaq and the S&P. The breadth of the 2000-stock-index tends to filter out the noise in the market, which makes it a more efficient market to trade. The brokerage houses tend to tout the S&P and Nasdaq markets because they are best know to the public. The Russell 2000, however, is utilized a great deal by institutional players because it trends so well. 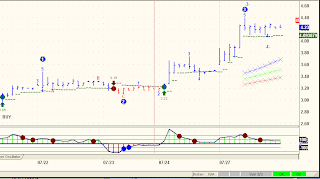 However, there is another market also catching the eye of many day traders — E-mini Russell futures. A quick glance at the top trading systems we ranked across seven different statistical measures at the end of 2004 showed something extraordinary — several E-mini Russell trading systems occupying spots at the top of the list. So let's take a look at the RUT, which coincidentally is the base index for four of the highest leveraged ETF's: TNA, TZA, BGU and BGZ. 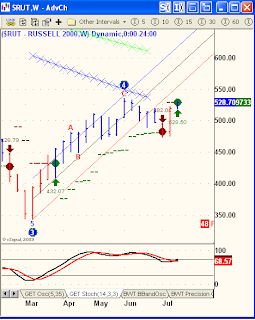 Above is our big picture Weekly chart of the Russell 2000 index. A week ago it flipped from LONG to SHORT for the first time since early March. Noteworthy is the BUY level, at 529.12, just about 10 points above Friday's close. Remember, on this Weekly chart, the index has to close above 529.12 next Friday to flip back to LONG. 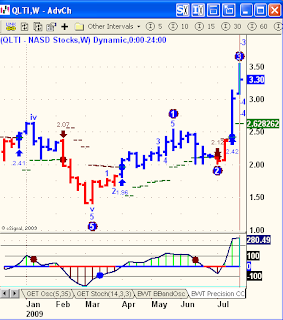 Note here how the False Bar Stochastic is overbought and now in position for a reversal down. This can be quick, as soon as next week, or it can drag out for several more weeks. 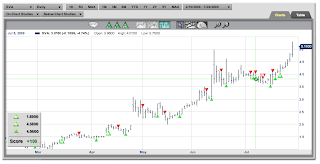 The above chart covers the first two weeks of trading in July. 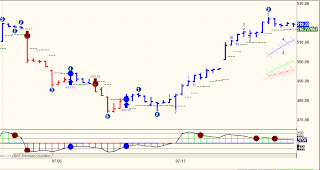 Noteworthy here is how well this time frame stayed LONG with a trending RUT over the past week. 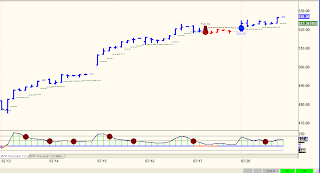 The Blue Wave Precision CCI basically confirmed two trades, a SHORT followed by a LONG. 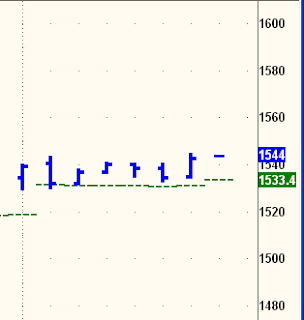 The chart above is the 5-minute RUT spanning the last two days of trading. What I see here is an excellent trading system with the only rough period at the subtle change of trend between the end of trading Thursday and early trading on Friday. Under the assumption these prices were available and that the Triple Beta ETF's performed intraday as they are structured, two days worth of trading like this hypothetically generated a return of 9.73%. There are usually about 20 trading days in a month, so that there are 10, 2-day periods a month. That generates a hypothetical return of 90.73% a month. Too good to be true? OK, let's reduce gains by 90% just for the sake of skepticism. Now the return is a measly 9.73% per month. Hardly worth getting up out of bed, eh? Sometimes I simply stand back and take a broad view of my models, what works and what doesn't. This morning was one of those times, not looking for anything in particular, just browsing over test results, comparing them to my real time trading results, looking for any obvious red flags or other patterns, always seeking better trades, better returns and to some extent, less complexity and less work. Today's surprise was the RUT, how well it trades with Blue Wave and how much better RUT trends, even on the shortest time frames I trade.